Bandai Namco announced during a live stream two brand new Super Robot Wars games: Super Robot Wars T, standing for “Terra”, for Switch and PS4, and Super Robot Wars DD, standing for “Dimension Driver”, for iOS and Android. Both games will release in 2019. 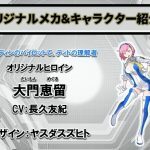 An “Asia version” of Super Robot Wars T with English subtitles will also release in 2019. Humanity is on the decline. Outer space expansion reached a stalemate, morals are decaying and the universe is controlled by corrupted individuals, filling its inhabitants with fear and resigniation. In this twisted era, humanity and the Earth are engulfed in a war that will determine the true meaning behind their existence. 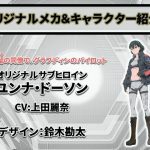 “Units only” means the story events of that series won’t be featured fully in the game, or not at all, but mecha units from the series will still appear. Bold entries are series which are appearing for the first time ever in a Super Robot Wars game. As a side note, Super Robot Wars T’s official site’s URL is “sorewaterada.suparobo.jp”, a joke using series producer Terada Takanobu’s name. He himself mentioned how people will jokingly ask “does the T stands for Terada?” for years to come. They purposely avoided using the letter T for that reason, since the series’ birth more than 25 years ago. But now they’re running out of letters, so they decided to use it. Expelled from Paradise is an anime movie released in 2014 and written by Gen Urobuchi. It’s a sci-fi story and features mechas so its inclusion isn’t much of a surprise. Cowboy Bebop, however, is an extremely pleasant surprise. But again, not that shocking when thinking about it, seeing it’s the anime’s 20th anniversary. Moreover, Cowboy Bebop should fit particularly well with the game’s setting described in the trailer, so it’s not that far-fetched. Now to see how they will handle some iconic fistfights in the series, but that’s why G Gundam is here too I guess. Arcadia of My Youth: Endless Orbit SSX is the TV series following the Arcadia of My Youth movie, part of the Leijiverse featuring Captain Harlock. After Space Battleship Yamato in Super Robot Wars V, and Nadia – The Secret of Blue Water in Super Robot Wars X, I was definitely expecting another spaceship series this time, either something with Harlock, or Bodacious Space Pirates. 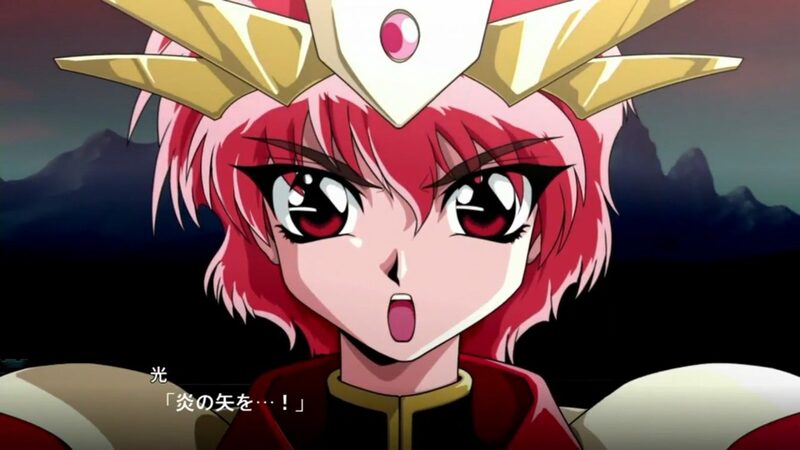 Rayearth is one of the most wanted series ever by fans and it’s finally in. Voice actor Kenji Akabane, present on stream, expressed nicely what every Rayearth fan felt. He was ecstatic when the trailer ended, saying he’s been watching the anime and reading the manga with his little sister when they were kids. The comments on Niconico when it appeared were amazing too. As a side note, Akabane-san’s favorite seems to be Umi. While more than half of the series were already present in the past three games, and probably won’t have many new animations in SRW T, it’s still a very interesting series list overall, with four amazing debuts and very good returners. 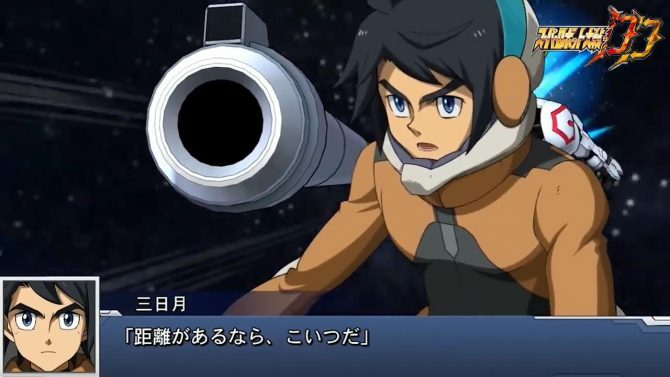 Gun X Sword is appearing for the first time in a voiced SRW game, as it only appeared on SRW K on DS in 2009. “Gun X Sword” was trending on Japanese twitter after the announcement. Van’s voice actor Takanori Hoshino was present on stream, with a brand-new hat similar to Van’s he specifically bought for the occasion. Gun X Sword is a peculiar mecha series, starting with the main character, Van, who isn’t a teenager boy for once, so it really left an impression even though it’s been 13 years since it aired. Hoshino-san was really happy to voice him again. Back in 2009, when SRW K released, Hoshino-san appeared on Super Robot Wars‘ radio show, and Terada-san promised him back then that Gun x Sword will one day appear in a voiced game, and it’s finally happening. As for G Gundam and GaoGaiGar, Terada-san said they wanted to include them again much sooner, but couldn’t for various reasons. One of these reasons is how they’re both beloved series and packed with hot-blooded, amazing fights. So it’s very hard to animate them well enough to do them justice. They purposely barely ever used both in the same game for these reasons. This time, Terada-san talked about it with Mogami-san, and all the conditions were met, so they decided to include both. The game’s voice recording went well, and the amount of lines this time is higher than usual. Hoshino-san had a bit of trouble at first voicing Van again after all these years, especially with how he screams all the time when piloting. He was constantly eating honey and throat candy. And yet he still managed to record all his voices perfectly in one day. According to Terada-san, most people take two days to record their voices in an SRW game like this. Hoshino-san back in 2005 was still a rookie voice actor, and he improved a lot since, so while it was hard giving his voice the same “rookie feeling” from back then, he did a great job. Gun x Sword is themed around revenge, and in a sense, he took his own revenge from back then. Akabane-san, who voices Kouji Kabuto in Shin Mazinger, said something similar as well. Nowadays when voicing Kouji, he feels like he can do better since he greatly improved, but then again removing all the bad parts from when he was a rookie would denature the voice. It’s a dilemma a lot of voice actors face when reprising older roles. Nobuyuki Hiyama, who voices Maito in Might Gaine, told them the exact same thing too. World 1: Devilman (original manga), Steel Jeeg, Mazinkaiser (OVA), Super Electromagnetic Robo Combattler V, Aura Battler Dunbine. World 2: Super Electromagnetic Robot Voltes V, Mobile Suit Zeta Gundam, Mobile Suit Gundam: Char’s Counterattack, Mobile Suit Gundam Unicorn, Getter Robo Armageddon, The King of Braves GaoGaiGar, Rebuild of Evangelion 1.0, Rebuild of Evangelion 2.0. World 3: Full Metal Panic series, Mobile Suit Gundam Seed, Mobile Suit Gundam 00, Code Geass: Lelouch of the Rebellion. World 4: Armored Trooper Votoms, Blue Comet SPT Layzner, Zegapain, Zegapain ADP, Valvrave the Liberator, Mobile Suit Gundam: Iron-Blooded Orphans. As you’ve seen, the cast list is divided into four. As you start the game, you will have to choose one of the four worlds, but past the early stages, all series will join together and you will be able to use everyone. Each world’s series are loosely linked to a particular theme or games they appeared in: Showa Era Japan is the theme of the first world. The second world has series which were mostly in the Super Robot Wars Alpha games. The third one, the Super Robot Wars Z games. And the fourth one is newcomers and Cross Omega. This is the first time Gundam IBO and Valvrave appear in SRW. World 4 doesn’t have any “Super Robots”, so you won’t have any at first if you start with this world, but Terada-san thinks Valvrave is pretty much a “Super Robot”. Super Robot Wars Dimension Driver‘s producer is “Red”, a Bandai Namco employee who always appears on Super Robot Wars streams for more than a year now. He’s always cosplayed as the character Kyosuke Nanbu. The stream started with a joke on how he wouldn’t appear anymore, but it turned out that he’s the producer of the game. 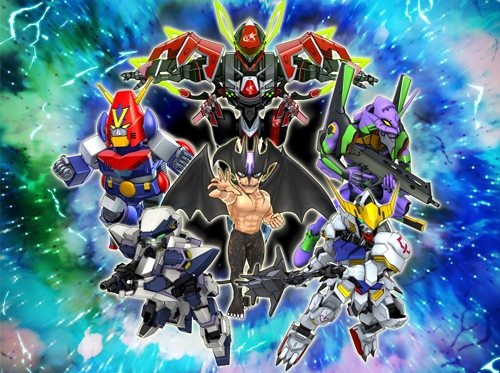 Super Robot Wars Dimension Driver is quite different from other games in the series. First off, there is an automatic mode. Next, there isn’t an “Ally Phase” and an “Enemy Phase”. Instead, each unit acts according to their speed stats, and you can check who will act next with the timeline at the top left of the screen. The camera icon is used to enlarge or reduce the map size. Akabane-san and the others joked on how it could be to take screenshots of cut-ins of female characters with bouncing breasts. 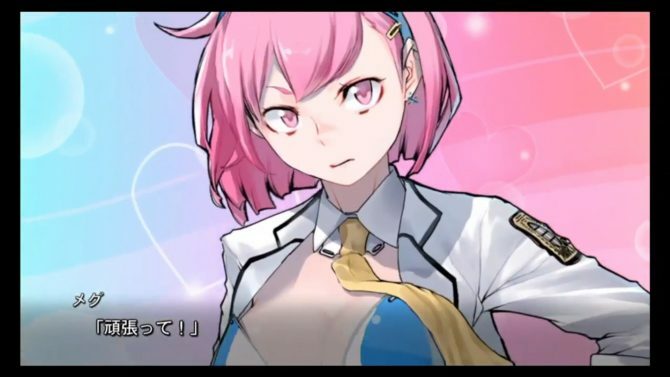 All units in the game can be obtained in the story mode, without having to win them in the gacha. The weapon system is also very different from usual. Each unit only has one “common” weapon, and you must equip different “unit parts” to be able to use stronger attacks in battle. Each unit can equip up to five units parts, but can only equip one unit part that unlocks a strong attack at a time. For example, GaoGaiGar can’t have Hell and Heaven and Broken Magnum at the same time. You can equip any part on any unit, for the stats boosts, but a unit can’t use another unit’s attacks. 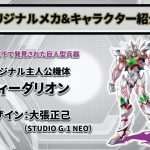 Moreover, Super Robot Wars Dimension Driver ‘s original characters and mechas were revealed, some of which were designed by legendary animator Masami Obari, who appeared on stream. 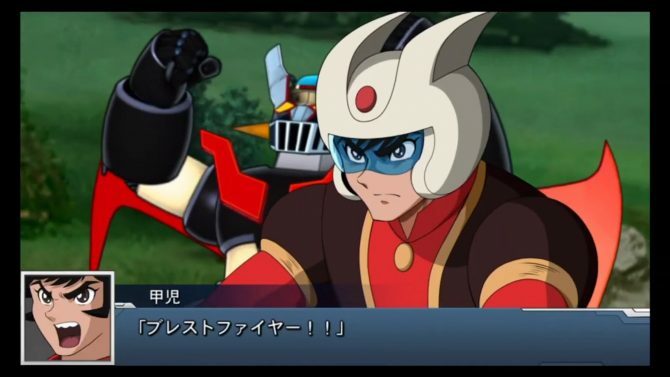 It was the first time he appeared on a Super Robot Wars stream. He also designed the game’s logo, and it was his first time doing logo design as well. We have the main character Dido, voiced by Youhei Azakami, designed by Suzuhito Yasuda, and piloting Deedalion, designed by Masami Obari. Deedalion is an over 20-meters tall “weaponized giant” and not quite a mecha. Then we have the “heroine”, Meguru Daimon, who is described as “the only one who truly understands Dido”. She’s voiced by Yuki Nagaku, also designed by Suzupin, and she’s piloting Meraphdin, designed by Mika Akitaka. Meraphdin is an alien robot which was repaired after it was found beneath Antartica by MART, the Antartic Bedrock Investigation Team. Some parts of it are still broken, like the head sign and right shoulder. After that, we’ve got the “sub-heroine”, Yunna Dawson, voiced by Reina Ueda, designed by Kanta Suzuki and piloting the “Real Robot” Graphdin. Yunna is a co-worker of Meguru. Graphdin was designed by Kenji Teroaka and is a “Dominant Trooper”, robots developed by MART. There are other “sub-heroines” besides Yunna they will reveal later. Lastly, we have the “rival mecha” Angilon, a pilotless sentient “giant” designed by Kimitoshi Yamane and voiced by Tomokazu Sugita. They asked Yamane-san to design Angilon to contrast with Obari-san designing Deedalion. Masami Obari and Kimitoshi Yamane are longtime friends who worked on many projects together like Bubblegum Crisis. Lastly, Super Robot Wars DD will have a “test play” session from December 14 to December 16 in Japan, where the first stages of World 2 will be playable. It seems another test play will also be held for Asian countries including Taiwan, Hong Kong, and Macao. It’s unknown for now if that test play and the game will be in English or not though. Producer Red said that “overseas players can enjoy it too” so it should be. 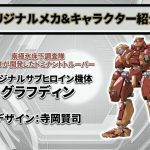 Screenshots of all the characters and robots in SRW DD are included below along with the trailers. 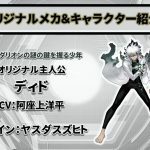 Obari-san also mentioned he worked on multiple attack animations for DD, including the main character’ robot Deedalion. As for Cross-Omega news, the game will add three new entries: Patlabor The Movie, Linebarrels of Iron (manga) and The Brave Fighter Exkizer. The first two are time-limited additions. OG characters will be added too: Axel Almer in Soulgain and Lamia Loveless in Vysaga. Space Battleship Tiramisu will also be added at some point. One last interesting note is how Terada-san mentioned how among all the new series who joined SRW today, they had the choice to put certain series in either T, DD or Cross Omega. He didn’t precise which series, and only said they tried to put different appealing series in each game so that fans will play all three games. 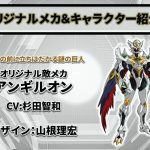 Super Robot Wars T will release in “2019” for PS4 and Switch. An English Asian version will be coming too. 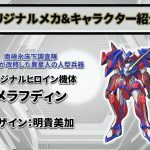 Super Robot Wars DD will release for iOS and Android in “2019”. The release date for Super Robot Wars T will be revealed a bit later. Probably in around two months, with a second stream that will also reveal the second trailer and the game’s Original characters. This week’s Famitsu will also feature 10 pages on the game, recapping the information from the stream. Update: Apologies. The producers on stream did not indicate an Asia release with English subtitles. However, they did mention an Asia release, without any mention of supported languages. There might very well be one coming with English subtitles as they’ve been doing it for the past three installments. Update 2: Super Robot Wars T‘s Southeast Asia version will indeed feature English text.